Russian solar firm Hevel Group announced that it has completed construction on the 20 MW Maima solar park in the Altai Republic, Russia, mounting heterojunction modules manufactured at its facility in Novocheboksarsk. After upgrading its amorphous silicon (a-Si) thin film production to HJT technology, with European manufacturers Meyer Burger and Singulus providing equipment earlier in March this year, Hevel Group doubled its output capacity at the Novocheboksarsk facility in the Chuvash Republic to 160 MW. “This year we have upgraded the production line, and also put the first solar power plant with HJT modules in operation. And that’s just the beginning. Next year we are expanding HJT solar module production to 220 МW, and by the end of this year we start projects abroad”, said Igor Shakhrai, CEO of Hevel Group. 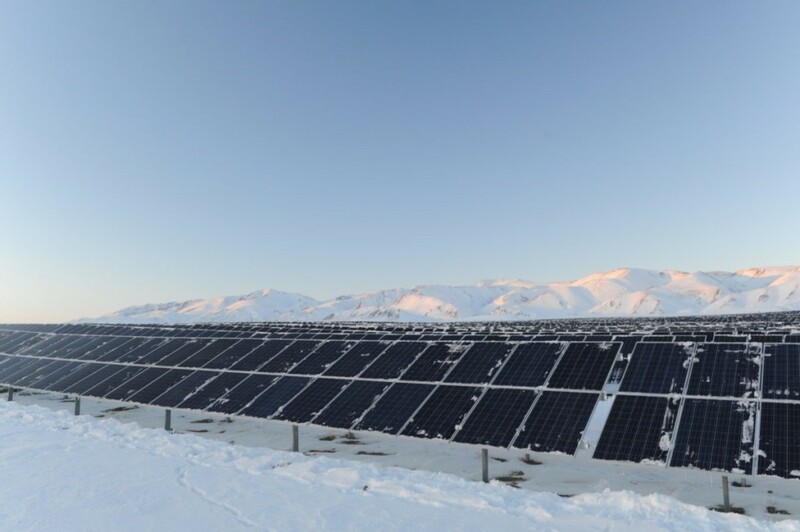 Moreover, Russia’s integrated solar company said that by finishing the construction works at the Maima solar park, it has completed 50% of its 90 MW project pipeline in the Altai Republic, known for having its electricity generation fully based on renewables. “Today total installed capacity of all solar parks in operation in the Altai Republic is 40 МW, and in winter, in period of peak loads the region consumes 120 МW. So about one third of our needs is secured by solar generation, and we go on with our plans to increase capacity”, stated Alexander Berdnikov, the Governor of Altai Republic. Simultaneously with the Maima solar park, the company said that another solar PV plant was switched on in the Altai Republic – the 5 MW Onguday solar power plant. The joint venture between Russian companies Renova and Rusnano, Hevel LLC, looks to achieve its goal of developing more than 500 MW of solar projects by 2020. Meanwhile, Russia’s 2030 solar target stands at 2.6 GW. «The efficiency of solar electric plant directly depends on the insolation level. The maximum output can differ from region to region, so that in hot regions it falls on summer, and in cold ones, for example in Siberia, the differences are evened because of the high insolation in winter time,”- explained the group Hevel their calculations based on the capacity factor. If the capacity factor went beyond the plan value – 14 %, the day was cloudless or “totally sunny”. Comparing six regions, the richest for sunny days was Astrakhan oblast – there were 86 cloudless days from 92, and in Saratov oblast – there was recorded 85 sunny days at one plant. Other plants recorded 62 days from 83. 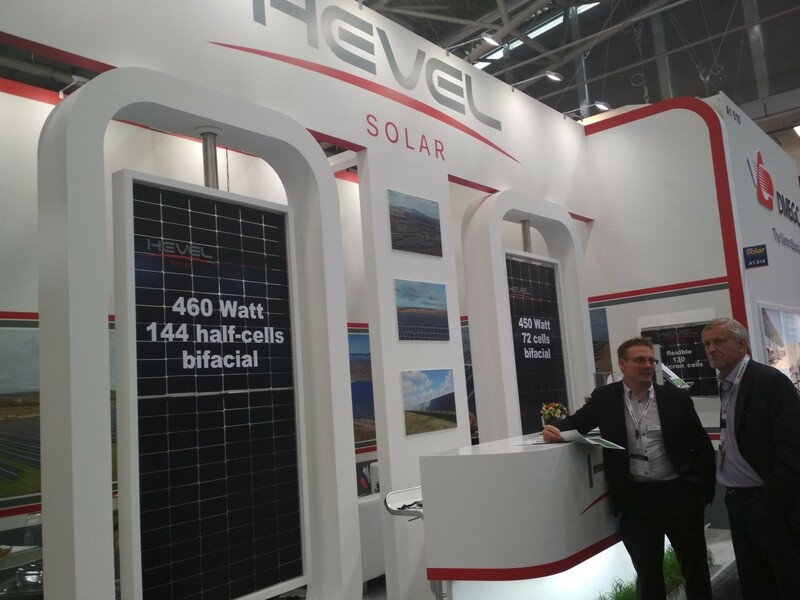 Hevel Group has taken part in Intersolar Europe exhibition in Munich. The company has demonstrated its own heterojunction family products: 60 cell 320 Wp modules, which are being produced at Hevel’s fab since 2017 and flagman products which will be produced since 2019: 72-cell bifacial 450 Wp module and 144 half-cells bifacial 460 Wp module. At the booth, there were also presented 130-micron flexible heterojunction module and flexible 90-micron cells which are suitable for any surface. During the exibition every customer could also test the efficiency of Hevel’s heterojunction cells which now has reached 23% in mass production. Russia-based integrated PV manufacturer Hevel Group have provided specialised semi-flexible heterojunction cell-based laminates to a solar electric catamaran that is planning a 5000 km long journey across Russia. Hevel Group, which is owned by Russia’s Renova Group, which has switched production from amorphous silicon thin-film technology to high efficiency silicon heterojunction (HJ) technology that has achieved cell conversion efficiencies of 22.8%, designed and assembled the modules for the catamaran at its R&D centre in Saint Petersburg. 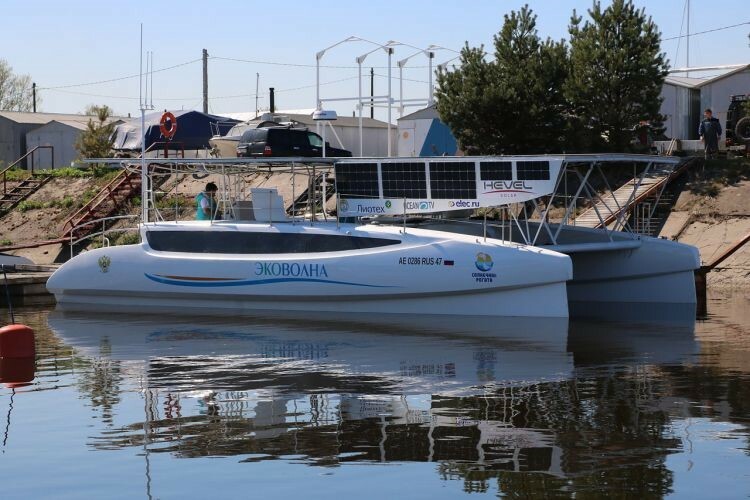 The catamaran has 9 kW solar system to power the boat, which will make a series of stops on its trip that includes 40 cities in 20 Russian regions, according to the company.